Jesus comes to his disciples to comfort them in their worst nightmare - a storm on the sea. 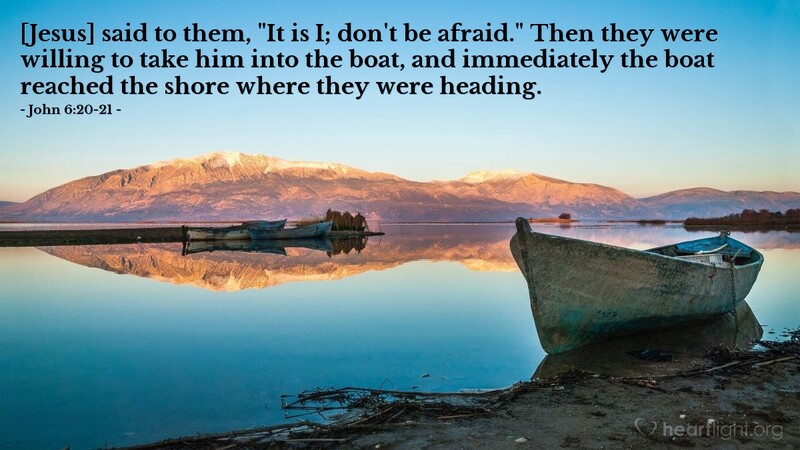 He literally tells them, "I Am, do not be afraid." Two key things are here for us to notice. First, Jesus uses a name ("I Am") that identifies himself with God who delivered Moses and the Israelites from Egypt. Second, he uses a surprisingly frequent command found throughout the Bible: "Don't be afraid." When we are willing to invite Jesus into our lives during the middle of our storms and messes, he not only says, "I Am, don't be afraid!" but he also helps us find our way to our most important destination, ultimate deliverance. O God, the great I Am, you redeemed Israel from Egypt, you won great victories for David, and you raised Jesus from the dead. I know you can deliver me from what may come my way. Please forgive me when I don't act with the boldness that is called for by this kind of faith and strengthen me to more confidently trust in your presence. In the mighty name of Jesus I pray. Amen.